Skin issues are common with all of us, you’re not alone. The problems of dry skin, acne-prone skin and, with passing years, the problem of dull, aging skin. To prevent or avoid these concerns, so much care is taken. Still they keep resurfacing. The most common mistake that fail us is the belief that expensive skin regime can always get us out of these. The truth is, skin care products do help, but mainly by supporting your already good skin. They are seldom known to completely reverse your skin condition. 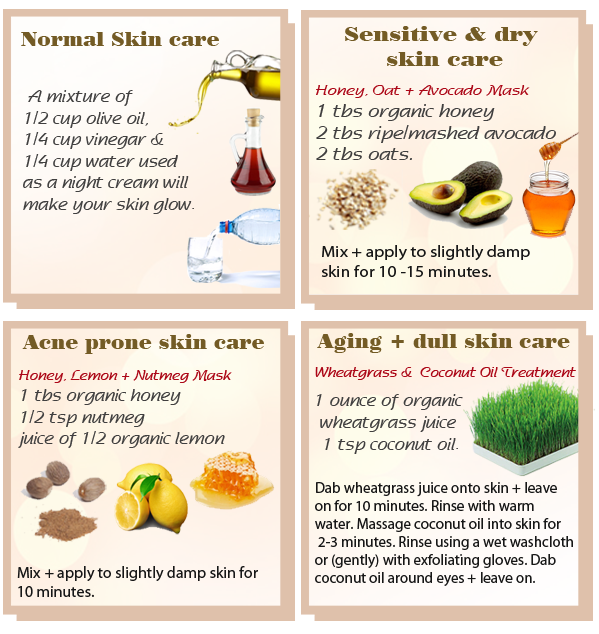 Sometimes our homes abound in some of the best skin care remedies. Here we’ve compiled some of the best DIY remedies for most common skin worries. Remember: All these are good, but it is not wise to persist with DIY treatments in cases of severity where expert advice is a must. Your skin, its beauty and its problems may be as unique as you are. You may be unaware that it is allergic to some home fruits or vegetables. Therefore you are well advised not to pick up any DIY treatment you see unless you know what’s your skin type. Pick your ingredients carefully. In general, honey, aloe, tea, yogurt are good. However, exercise caution when the ingredients list include citrus, egg whites, spices and vinegar. And for prolonged issues there is no alternative to expert advice.